With all the turmoil of the Tallahassee real estate market over the past 10 years, a question on the mind of many people these days is "What is my house worth now?" It is so tempting to refinance a home or make the leap into a larger home with interest rates below 3.5%, so I'm not really surprised when people ask me questions about the value of their home. Since a single blog post cannot possibly begin to report an answer to everybody's question specifically regarding "What is my house worth now," I have chosen to work an example using a random home in the Killearn Lakes Plantation subdivision in Tallahassee. What Is My House Worth Now In Killearn Lakes Plantation? The first thing you need to do is find information about the current market in your specific neck of the woods. For our example, I start by discovering the fact that there are 44 homes for sale in Killearn Lakes Plantation. I look at each of these homes in order to get a feel for the competitive environment for any new home entering that market. Next, I look to see what property values have been doing for an extended period of time. 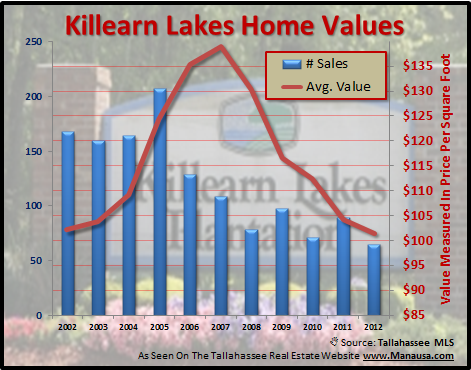 Below, the Killearn Lakes home value trend is on the decline, so when asking "what is my house worth now?," you should be thinking "less than it was before." Currently, home values in Killearn Lakes Plantation have fallen to an average of $102 per square foot over the past year, meaning that current values are right around $100 per square foot. Does this mean that all homes in Killearn Lakes are worth $100 per square foot? Absolutely not. It merely shows relative value changes over time. I would say all homes in Killearn Lakes Plantation are worth less than they were last year. But please put this in mind. If I have spoken to 1,000 homeowners over the past few years about "what is my home worth now?," and if I have asked 1,000 homeowners how their home compares to the average in the neighborhood, I cannot remember a single one telling me their home was below average. Every homeowner thinks their home is special, and rightly so. But the market of buyers will have an unbiased view of your home and will consider its features and amenities and compare them to the competition. Case Study: What Is My House Worth Now? A fictitious homeowner asks "What is my house worth now?" Let's say she owns a 2,200 square foot home in Killearn Lakes with 3 bedrooms and 2 baths. We know the current value trend is declining, and with the increased number of distressed homes for sale in Tallahassee, we expect values to continue to decline for the foreseeable future. With roughly 1 in 3 homes sold recently from the short sale and foreclosure list, we know that buyers are looking for special home values in Killearn Lakes Plantation. 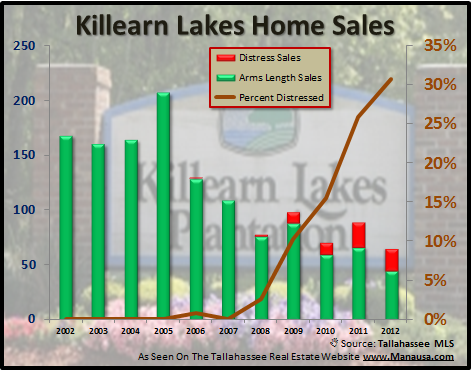 To zero in on specific comparable properties though, I would look at recent arms-length home sales in Killearn Lakes, for homes with similar amenities and of a similar size. I would ensure that the similar properties that I chose were not on a lake or golf course, and did not have a pool (since my example home does not offer these amenities that can be found throughout Killearn Lakes Plantation). I would ensure that I only compared it to homes of a similar age as well. When I plug these variables into my list of recent sales, the four properties below appear the most similar. Thus, if she has a 2,200 square foot home in Killearn Lakes and asked me "what is my house worth now?," I would conclude that she should be able to sell it for $200K to $225K. With values dropping and distressed inventories rising, I would expect her to have better success today at the higher end than she would six months from now, even though this is normally the "slower" time of year. Now, if YOU have been wondering "What is my house worth now," just drop me a note and we can schedule a time to review the particulars of your specific home.